The Pyle Pro PWMA50 Waistband Portable PA System is a powerful yet portable self contained PA speaker that's worn around the waist, and ideal for fitness instruction, coaches, tour guides, teachers and more. The unit features a full-range loudspeaker and is powered for 12 hours on a full charge. The full range loudspeaker features a projection range of up to 1/2 mile, and the included headset microphone delivers hands-free microphone operation. 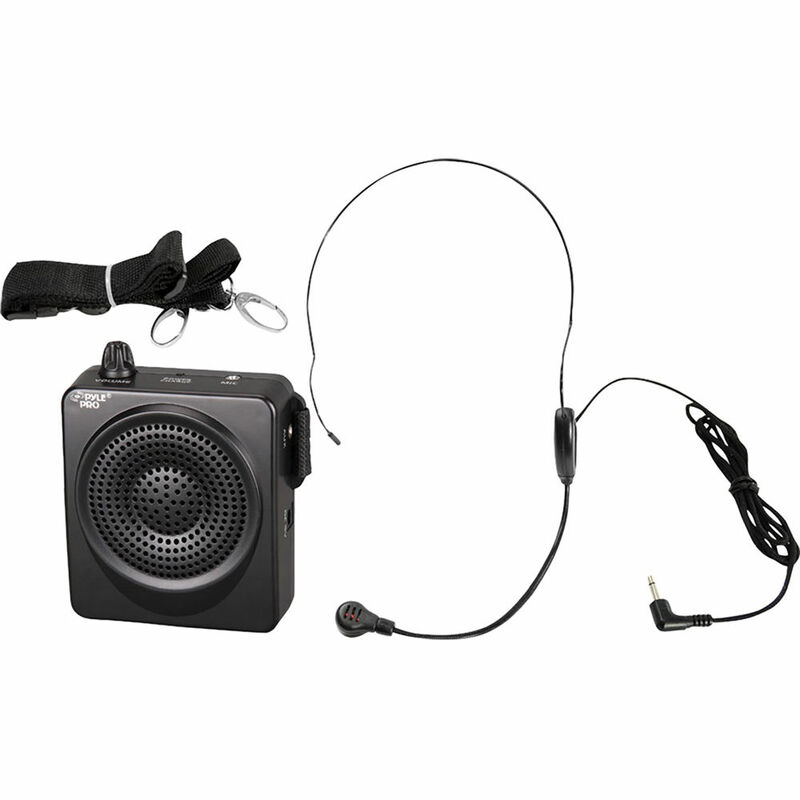 Box Dimensions (LxWxH) 11.3 x 5.6 x 2.8"
PWMA50 Waistband Portable PA System (Black) is rated 4.2 out of 5 by 34. Rated 3 out of 5 by Lynn G. from Not sure about this I bought 4 of these to use at our camera club for judges to talk about the entries. We aren't in that large a room, but with judges facing away from the audience, we decided to get these. After one use, I'm not sure that these are strong enough that the people 15 feet behind the judges heard any better than without them. They're easy to use, but perhaps we're missing something that would make them louder. The cost fit our budget so we're going to make do with them. Rated 3 out of 5 by Londo from Decent Mic/Amp Combo Nice pack, but you really have to get your mouth close to the mic to get a good amplification of your voice. Not so great if you're trying to be heard over a room of people talking, but useful if you are speaking to people who are quiet and just need to amplify your voice without shouting. If you want to be heard over a crowd, buy a bullhorn. Also, if you turn the speaker all the way up, it is very easy to get feedback loop noise. Rated 4 out of 5 by Andrea the tour guide from Nice for Hands-free tour guiding We do garden tours around public gardens that cover about 8 acres. It's great to be hands-free! The tours average 30 people, and the speaker seems to be able to reach them all. There's a bit of a learning curve to get it all situated to avoid reverb. But once you learn to keep metal away, and to avoid waving hands in front of the speaker, and to keep the volume back a little, and to keep the mic close to your mouth, it works well. It's delicate...not built for rough treatment...so I hope my guides will be careful. Just used it a few times...we'll see how it fares over a year's time. Rated 5 out of 5 by Jungle Missionary from Excellent Voice Extender I was quite surprised at the usefulness of this little portable PA system. Turning it on right out of the box, I went outside to test it. The sound is very clear up to quite a several hundred yards. It is very small and once strapped to your waist, you hardly notice it present. The headset/microphone is very light and comfortable. Cannot think of anything that would be a negative especially at this pricing and size. Rated 4 out of 5 by Robo tourguide from great little PA The PA is easy to use and has good range as a tour guide this is just what I need being outdoors in all weathers. I find the headband for the mic is too small and needs to be adjustable for a comfortable fit. The charger should come with various adapters for different countries, I had to buy a universal adapter to charge the unit. The instruction sheet on how to use the PA needs work, eg adjust fitting straps as shown diagrams are not there and the indicators for where things are are wrong. eg. where the mic plugs in is shown as the power indicator. Rated 5 out of 5 by Duane Stork from You will be heard in a crowd!! For years I have shot participants in marathons and all sorts of road races. I photograph the pre race candid s and the post race finishing photo with their medals. It is always crazy loud and at the end of it my voice is shot. I purchased this little thing not knowing if it would help but I was very impressed. I was able to use it for 5 hours yesterday and it performed better than expected.It fit me well and did not get in the way of my shooting. I was able to use a normal voice and everyone could hear me clearly, no shouting over the crowd and music. This thing is solid and the cord for the mike is fabric not plastic so I think it will hold up well. In fact I snagged it once during the shoot and just plugged it back in and kept on going.It is small, 3.5 by 4.5 and you do not notice you are wearing it. The mike portion is small and fits on my head very comfortably. It helps to have the mouth piece as close to your mouth as you can. It is very light to wear and I did not even notice it on my head during the shoot. This has been a great purchase for me. Rated 5 out of 5 by Shanis from Great device I am a kindergarten teacher and it is hard to be yelling all day so all the kids can hear you, this device was my solution, worked perfectly and my throat is thankful. This specific unit sold is new or usted? Have seen some usted products sold by this site... Cheers. does this come with a charger? What is a Charger Belt Clip? An AC battery charger is included. We have an echo in the building and were concerned the system would play back with the echo or pick up the echo strongly and drown out the tour guide have you heard of this before? can this be used with clip-on mic, and if so, what kind? I never have used it with a clip on mic - I have only used the mic that comes with it. I just put it around my neck - not as a head band.